CONGRATULATIONS to the M’s collective 1-2 punch!!! 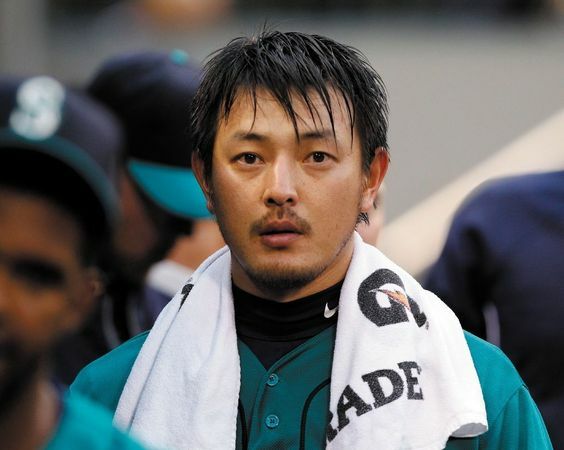 Iwakuma, however, is scheduled to start for the Mariners next Sunday, the last day before the All-Star break. If that happens, MLB rules dictate he may opt to be replaced on the American League roster, or be limited to one inning. Iwakuma would still attend the game at New York’s Citi Field and go through all the festivities and be introduced with the team. Iwakuma has the lowest ERA in the American League (2.60), followed by Hernandez at No. 2 (2.69). Iwakuma also has the lowest WHIP in the AL (0.88) to go with a 7-4 record. Hernandez is 8-4 and ranks fourth in the AL with 130 strikeouts. Iwakuma’s chances seemed to have dimmed with a stretch of four starts in which he went 0-3 with a 5.54 ERA to raise his ERA from 1.79, but his body of work over 18 starts prevailed. Unfortunately, no Rauuuuuuul . . .
Raul Ibanez is the only player ever to be in his age-40 or older season and have at least 20 homers and 40 RBIs before #ASG break. Alex Liddi traded to the O’s and International Draft picks swapped . . . 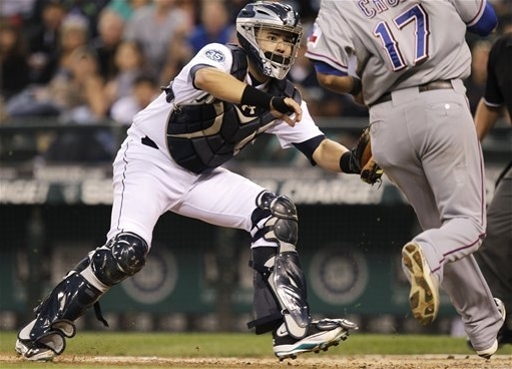 The Mariners have traded third baseman/first baseman Alex Liddi and their international signing slot No. 3 for the Orioles’ international signing slot No. 2. Liddi is reportedly headed for the Orioles’ Triple A affiliate in Norfolk. Liddi, 24, has appeared in 8 games with the Mariners this season (.059/1×17), spending most of the season with AAA Tacoma. With the Rainiers he is batting .263 (63×240) with 11 home runs and 43 RBI. 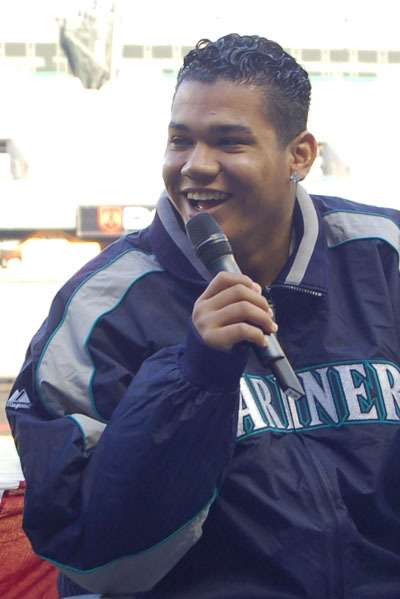 Liddi was originally signed by the Mariners as an international free agent on Sept. 9, 2005. The native of Sanremo, Italy is the first Italian-born and developed player to appear in a Major League game. This basically gives the Mariners more money to spend on the international free agent market. 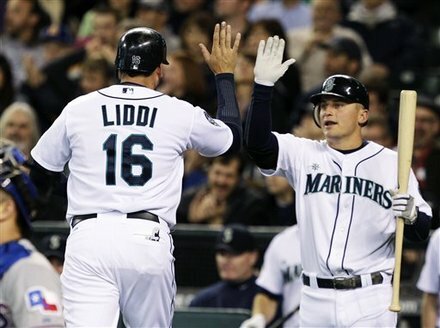 Liddi was designated for assignment when the Mariners called up Brad Miller. The team had 10 days to either release, trade or outright Liddi. With the Orioles likely to claim him off of waivers, the Mariners picked up some more money on the international market instead. Good news on the bullpen front . . . I decided at the last minute to attend the game today. It would have been SO worth it if the M’s had pulled it out. As it was, the loss made my mound of chores and errands put off all the more daunting. Oh well, at least there was that bit of history in seeing Mariano Rivera throw his last pitch ever at Safeco Field which resulted in his 23rd save of the season and a series win for the Yanks . . .
Felix really had to work hard today (especially in the first TWO innings, where he threw 40 pitches and gave up both his walks and his only run). Despite his great final line, it just seemed like he never truly got into a groove. He also didn’t get a lotta help from his defense and, there was a bit of a scare in the 7th – after he got the first two batters out, Rick Griffin came out to the mound with Wedge. Not sure what the issue was but, he stayed in and struck out Gardner on THREE pitches for the final out. The M’s made Phelps work a bit in the first couple of innings as well. Jason led off the 1st with a single and Kyle walked with two outs but they couldn’t capitalize. In the 2nd, they were able to tie it up: Kelly had a great NINE pitch AB that resulted in a double and Alex walked (his first time on base since his call up) and Brendan singled to get Kelly home and tie the game. But, 1-1 is where it would stay until the 9th. In fact, Phelps faced the minimum in innings 3-7. Alex had a lead off double in the 8th but, after a sac bunt by Brendan, Jason and Nick struck out to end the threat. There was a glimmer of hope in the 9th when Kyle roped a single (extending his hitting streak to 13) on the first pitch but, Kendrys killed the hope by grounding into a double play (I’m thinking he needs to sit out a game or two and rest that back, clearly he’s not been himself the past few games). Raul was intentionally, unintentionally walked and hope rose again when Chavez, pinch hitting for Kelly hit a single but, as I tweeted above – that was all she wrote. 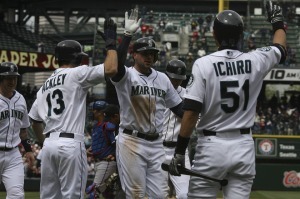 Iwakuma Wed + Felix Sun = Opponents hit .157, had on-base pct .189, and slugged .176… and beat the M's both games. M’s were 0-6 in such opportunities. the M’s and R’s had another 1-0 contest earlier in the season in Arlington which the Rangers won – Blake was the pitcher in that one as well. also – throwing out a would-be base-stealer AND getting an out at home plate on a relay. Another 2 DP’s from the DEE! Franklin Gutierrez, Erasmo Ramirez, Steve Delabar, Casper Wells join #Mariners. 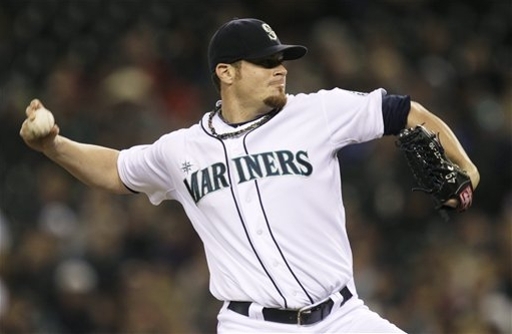 Carp & Pryor to DL, Beavan & Liddi to AAA Tacoma. Heal fast and well, Mike and Stephan! Good luck, Blake and Alex! Welcome back to the Show, Guti, Erasmo, Steve and Casper! What has gotten into “old man Millwood”?!? and now the Rangers at The Safe??? it took THREE pitchers to get through FOUR batters for THREE out – but, they did it. the M’s not only won a series against the Rangers, they managed to hold them to only SEVEN runs on FOUR hits and strikeout TWENTY-FOUR in the 3-game set. Liddi’s slam was just the second in major league history by an Italian born player. Reno Bertoia hit a grand slam on May 7, 1958, for Detroit against Washington. But, they just couldn’t put it all together tonight when it counted.